On 26th December 2004 a massive earthquake off the Western Coast of Northern Sumatra triggered a disastrous tsunami that hit the Asian region killing more than a hundred and fifty thousand people and affecting millions. The number of deaths recorded in Sri Lanka exceeds 33,000; millions of Sri Lankans were rendered homeless and damage to the infrastructure and the economy of the country is colossal. 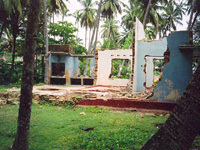 The event caused unprecedented damage to both life and property on the island. Essentially the tsunami was a three phase event. First came the drawback of water –the ocean retreated exposing the seabed for up to a mile out. Many people, young in particular, ran out on to the sand, excited by the completely unexpected exposure of thousands of fish. They did not realise they were running to their deaths. Then the great tsunami wave charged in – a 30 foot high wall of water, crashing boats on to the shore, carrying bodies and debris along with it, destroying buildings, terrifying those who witnessed it charging towards them. Thousands died instantly. Finally, the third and even more destructive phase was the drawback of the water back out to sea, the retreating velocity being much greater than that of the incoming wave. 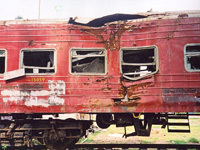 With a force as powerful as that of a bomb, buildings and vehicles -including a whole train- were tossed into the air. Bodies, homes and valued possessions were swept away; most never to be recovered. Hospitals, makeshift shelters, open areas and the roadsides were filled with dead, the dying and the wounded. Streets were littered with bricks, household items and recognisable pieces of what were once houses. ‘Tsunami, Tears and Humanity’ is an account of the tsunami event by P.K.Jagath Premalal who witnessed at first hand the unfolding of the tragedy. 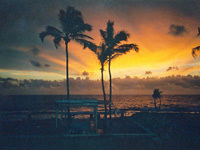 Jagath Premalal owns a guest house, Jaga Bay Resort, in Weligama on the south coast of Sri Lanka. His book offers fascinating insights, based on the personal experiences of himself and his family, into both the achievements and shortcomings of response and reconstruction efforts. 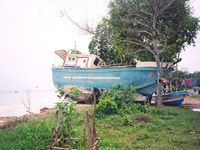 The book is written as an expression of thanks to the many people who devoted themselves to helping Weligama to recover, but also as a warning, in the event of future disaster, against repeating the mistakes made by aid agencies, however well-intentioned these may have been. ‘Tsunami, Tears and Humanity’ by P.K.Jagath Premalal was published by Sathmina Printers, Weligama, 2007. ISBN 978-955-50032-1-6 Price 10.50 GBP inc. post and packing. I am composing this whilst on a hillside in the town of Kandy watching torrential rain fall on a landscape that has recently suffered horrendous landslides and resulting deaths. All of the Charity’s Trustees are presently in Sri Lanka, visiting our many village projects and children whose families we support. Boxing Day 2014 marked the 10th anniversary of the worst natural disaster ever to strike this country, the tsunami that killed 36,200 people and rendered hundreds of thousands homeless. That day marked the beginnings of our project which over time has evolved from a University of Durham initiative to an independent Registered Charity. On the occasion of this tenth anniversary I thought I would send this note of reflection and appreciation to all of our present day donors, plus past donors and alumni whose contact details I still have. In a recent radio interview concerning the tenth anniversary of the tsunami I was asked how the people of Sri Lanka feel about this event today. I believe that the honest answer to this question is that they have very mixed emotions of both optimism and grief. There is no doubt that the economy and stability of Sri Lanka has improved very considerably in recent years given a great deal of post-tsunami reconstruction and the ending of the lengthy civil war. Tourism and other businesses are in the ascendency and job opportunities are far greater than ten years ago. Yet the raw grief and devastation of lives and livelihoods remains in the hearts and minds of many who suffered at that time. As the years have gone by we have continued to support tsunami affected villages and families whilst discovering other communities and humanitarian needs further inland which we have been able to support. Children and their families in many rural areas as well as in coastal zones remain deprived of such basic things as early years education, water supply and health care. Suffering and basic needs remain for so many. 10 new buildings which serve as multi-purpose community buildings and as pre- schools in most of the locations. Regular visits by Trustees for monitoring, evaluation and development of all activities and the consideration of new projects. None of these things would have been possible without our generous donors and the many volunteers who have given freely of their time. Funding over the years has come from a variety of sources including external grants such as that from the British and Foreign School Society, volunteer fund-raising, several anonymous donors, and donations for specific projects such as Mapalagama School, substantially supported by the Rotary Club of Alnwick, the well at Mederigama funded by Mezzino and the well at Thellula Janapodaya funded by the community of Spittal. In addition we have received a number of ‘one-off’ donations and have a wonderful team of regular donors. Thanks to the generosity of you all it is no exaggeration to say that we have changed thousands of lives for the better. On behalf of all of these people, most sincere thanks are due to you all for enabling a decade of support and hope for the future.